Ever since I was a kid I have been a fan of the Civilization series of video games. There was just something satisfying about building your own empire and either destroying your opponents militarily, economically, technologically, or in other ways. This is one of the reasons that I was interested in checking out Jon Shafer’s At the Gates. As the game’s title aptly points out, the game was designed by Jon Shafer a designer for Civilization 5. While the inspiration of games like the Civilization series is immediately noticeable, as soon as you start playing the game you notice that things are not exactly what you were expecting. Jon Shafer’s At the Gates takes a narrow approach to civilization building games creating an interesting gameplay experience that can also be quite harsh. We at Geeky Hobbies would like to thank Conifer Games for the review copy of Jon Shafer’s At the Gates used for this review. Other than receiving a free copy of the game to review, we at Geeky Hobbies received no other compensation for this review. Receiving the review copy for free had no impact on the content of this review or the final score. In Jon Shafer’s At the Gates you play as a lord in the crumbling Roman Empire. No longer can you rely on the support of the Roman Empire. As the leader of your kingdom, you need to manage the clans under your control as they gather resources and food. This is done so you can survive the upcoming harsh winter. In addition you need to grow your economy to help your kingdom grow while fending off other kingdoms and barbarians. Will your kingdom survive the fall of the Roman Empire or be lost to history? I mentioned at the beginning of this post that Jon Shafer’s At the Gates basically takes a game like Civilization and approaches it at a more zoomed in level. Each turn in the game corresponds to just part of a month instead of a year(s). Instead of controlling a whole empire you control one small kingdom. Basically the goal of the game is to create a kingdom and economy that can survive and eventually thrive. To begin each game you are given a group of clans which will grow as your kingdom expands. Each of these clans have their own personalities which includes strengths and weaknesses. You will train your clans in different professions which will allow them to help grow your kingdom. Different professions include exploring, fighting, gathering resources or refining resources into more valuable goods. In the early game you begin with almost nothing. You have one settlement and three clans. Your goal is to use your first families to gather enough food to survive the upcoming winter when food becomes scarce. While growing your food reserves, you want to focus on a couple other crafts to give you resources that you can trade to the caravan (which arrives every couple turns) for treasure. As you are unlikely to be able to create all the resources you need by yourself, you need to specialize in a couple areas and then use the caravan to supply you with the rest of the resources you need. The resources in Jon Shafer’s At the Gates are limited so when you exhaust a deposit of a resource it is gone for good. Therefore in the early game your kingdom has to act like a nomadic tribe periodically moving as your sources for resources run out. Eventually your kingdom will reach a level of research and resources where you can settle down and make more permanent structures that don’t deplete the resources on the map. On every turn you will take a couple actions. Each turn you can use your settlement to research one thing as well as train one of your clans in a new profession. Many of these will take several turns to complete so you won’t be be taking these actions every turn. Various professions give you resources that help attract more clans and help you research quicker. These two actions are really important as they are critical to your success in the game. You want to use each action every turn if possible. Outside of special actions that occasionally pop up, you then mostly just tell your clans in active professions what they should do for the turn. 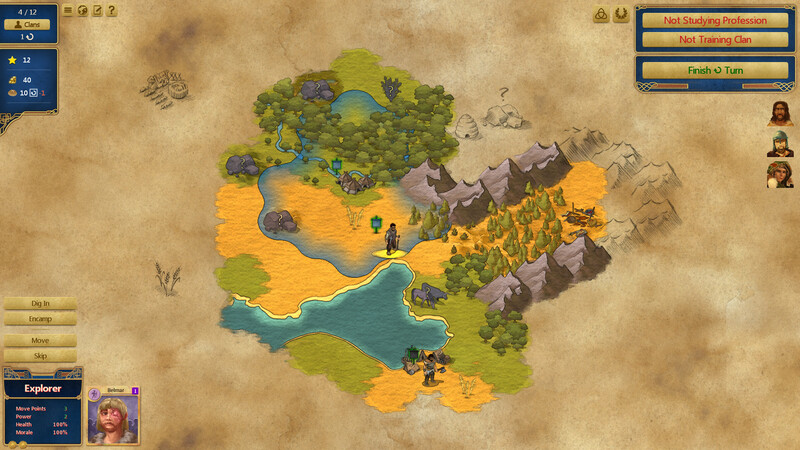 This is handled by moving the units around the map and having them gather resources from various deposits. Other than the scope, I would say the biggest difference between Jon Shafer’s At the Gates and the Civilization series is what part of the game is emphasized. In Civilization the game is mostly built around growing your civilization and dominating the other civilizations. Jon Shafer’s At the Gates focuses more on basic survival. You aren’t competing against the other civilizations as outside of attacking you they don’t impact your chances of winning the game. Your goal is to just survive and grow your kingdom enough to reach one of the winning conditions. You can win the game two different ways. First you can acquire enough resources to send some of your clans to the Roman Empire. Otherwise you can capture one of the Roman capitals. In both situations the game emphasizes building your economy as that is the best way to survive. When I first started playing Jon Shafer’s At the Gates I have to say that I felt a little overwhelmed. The game doesn’t seem that complicated at it really isn’t. The game throws a lot at you at the beginning of your first game(s) though. The game is supposed to get a tutorial at some point after release, which I think will really help. As it stands though there is quite a bit of trial and error as you try to figure out what you are supposed to do. In this regard I give the game a lot of credit as it makes it easy to find whatever information you may need. Hover over anything in the game and you will get a tooltip. Hover over any highlighted text in a tooltip and it will give you even more information. This is greatly appreciated as any information you may need can be found quickly. Still you might feel a little overwhelmed for your first game or two. That feeling goes away pretty quickly as the game is pretty easy to grasp once you get a hang of it. While I enjoyed Jon Shafer’s At the Gates, I don’t think it is as good as the Civilization series. I still had fun with the game but it just feels like something is missing from the game. I think it might be that I prefer the civilization building aspects of Civilization that are kind of missing in Jon Shafer’s At the Gates. The focus on just running one settlement felt kind of narrow. There are things I really liked about Jon Shafer’s At the Gates, but I wish it was a little grander in scale. That said I will say that Jon Shafer’s At the Gates is a unique experience. I found the emphasis on building an economy to be quite interesting. A lot of thought needs to be put into what goods you are going to focus on as you won’t have enough clans to do everything. You need to analyze what skills your clans have in addition to what resources are available to you. You should focus on those areas while using the caravans to supplement the other goods that you need. This is one area where I think the Civilization series was always kind of lacking. The economy aspect was always pretty streamlined where it is a major focus in At the Gates. Another thing that I liked about Jon Shafer’s At the Gates is that there is a real sense of danger/dread in the game. Unless you are fortuitous with your initial spawn, your kingdom is likely to struggle to survive for several years. As you have a limited number of clans, you need to choose whether you want to grow your economy or use most of your clans to gather enough food to survive the winter. Instead of being conquered or lose in another matter, you have to worry about your kingdom surviving the winter. This is an interesting feeling for this type of game. While I liked that the game has a sense of dread, at times I think the game goes a little too far. At times the game can be really brutal. Getting a good spawn at the beginning of the game is crucial. There will be spawns that doom you from the very beginning. The game can really mess with you in a couple ways. First you can be surrounded by barbarians and other hostile kingdoms. In one game I was surrounded on all sides by other kingdoms and barbarians. As you will be heavily outgunned in the early game, in this situation you will be wiped out quickly if that is what the computer desires. You could also be spawned in an area without a lot of resources. If you don’t have access to a lot of resources you are going to have a hard time growing your kingdom. Finally the traits of the clans you start with could make a big difference in the early game. Get a bunch of clans with undesirable traits and it is going to be a pain trying to manage them. As your initial spawn is going to have a pretty big impact on the rest of the game, you may be forced to start several games until you get a spawn that will give you a good chance at survival. Even if you get what appears to be a good spawn, things can quickly change. You could get a year into the game and realize that you probably should start over as things are likely to deteriorate over time. This is where a lot of the roguelike elements come into play. At least at first I think it will be pretty difficult to survive. Thus I think a lot of games will end with you failing. As I am not a big fan of roguelike games, this element kind of turned me off from the game. If you really like roguelike games though I could see you really liking this aspect of the game. For this review I used a pre-release version of the game. I mention this because while playing the game I did encounter a few game crashing bugs. In one particular game I reached a point where every time I tried to research/train a clan the game would crash. While this was a little annoying, I am not going to harp on it as I don’t expect the issues to last for long. These issues might already be fixed for the final release. If they aren’t already fixed I would assume that they will be fixed shortly. I just wanted to quickly bring them up to let people know that you might encounter a few occasional bugs while playing the game. I generally don’t talk about the art style in most indie games but it bears mentioning in Jon Shafer’s At the Gates. Most civilization building games tend to have a more realistic art style. Jon Shafer’s At the Gates uses a watercolor style. This style is not the type you normally associate with this type of game, but it works really well for the game. The art style looks really nice and does a good job creating a more laid back feeling for the game. I usually like to give an estimate for the length of a game but in the case of Jon Shafer’s At the Gates I can’t give a good estimate for how much time you will get out of the game. This is because just like Civilization, it really depends on how often you want to play the game. While I could see some games only taking a couple hours, I would estimate most games that you actually win to last quite a few hours. Basically if you are the type of person to get 50+ hours out of a game like Civilization, I could see you getting the same out of Jon Shafer’s At the Gates. When I first saw Jon Shafer’s At the Gates it looked a lot like another franchise that Jon Shafer worked on, Civilization. The two games do share a lot in common as the basic gameplay is very similar. While the basics are very similar, the overall games do play quite a bit differently. The Civilization series mostly focuses on building your civilization. Jon Shafer’s At the Gates has a much smaller scope as you are only focused on one settlement flourishing. This mostly involves handling the everyday duties of your various clans in order to produce resources to grow your economy and gather enough food to survive the winter. I didn’t enjoy At the Gates as much as the Civilization as I prefer the grander scale, but I still had fun with the game. The emphasis on gathering resources and growing your economy is an interesting addition to this genre of games. The game’s watercolor art style is also fantastic. At times the game can go a little too far though as your initial spawn can be brutal to the point where it is going to be hard to win the game. People who have never enjoyed 4x strategy games probably won’t like Jon Shafer’s At the Gates either. People who enjoy this genre of game though and don’t mind the smaller scope will probably really enjoy the game. The emphasis on developing a sustainable economy and gathering resources is an interesting addition to the 4X strategy genre. The game's art style is fantastic. The game can be brutal at times by giving you a bad initial spawn. The smaller scope isn't quite as good as the grander scale of games like Civilization.